"A plain but handsome Gothic structure, embracing an area within sixty-eight feet, by forty-four feet, without pillars, which is divided into three aisles, Middle, North, and South ..... On Wednesday the 25th of September, 1822, the ceremony of consecration took place at this Church; the day was favourable, and from the best observations it was calculated that near two thousand people were assembled ....."
St. Matthew's church remained as a district church within the parish of Hawarden until 12 December 1874, when the parish of Buckley (Welsh: Bwcle) was established in its own right. The new parish comprised the township of Ewloe Wood and parts of the townships of Ewloe Town and Pentrobin. 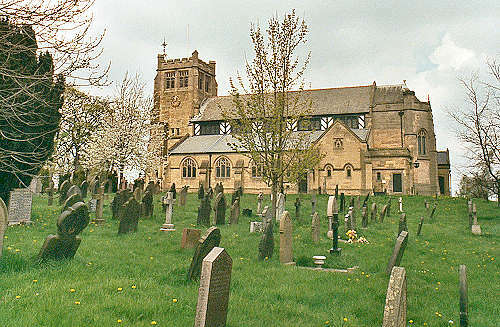 The church was extensively rebuilt during the early years of the twentieth century, and was re-consecrated on 11 January 1905. For family history information about the church and parish, visit the GenUKI Buckley page.